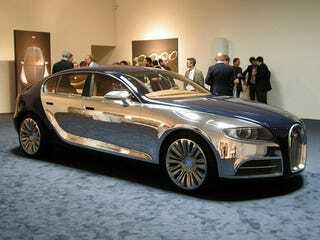 The Bugatti Galibier debuted in Los Angeles last week before a crowd of people wealthy enough to care. The photos finally reveal proportions of the front-mounted W16 super saloon concept. Also, the photographer managed to snag some "baby" Bugatti "news." The Bugatti folks spent time with many of the guests and asked for our feedback. Besides discussing the Galibier, I breached the subject of a likely "more economical" sports car in line below the Veyron. His response was such that I am guessing they have been working on this for a while. Fingers crossed! So the baby Bugatti lives?